Braai; the grilling of meat on an open fire. It is a national past time, a culinary art form and for millions of South Africans, a weekly ritual. The fire, the tools, the meat – all play an essential part to produce the ultimate feast. ‘Fire’ some prefer real acacia hard wood, while others made do with briquettes. ‘Meat’ range from a simple sausage to deboned leg of lamb and crayfish. ‘Tools’ can vary from fingers to specialised tongs with a built-in torch. 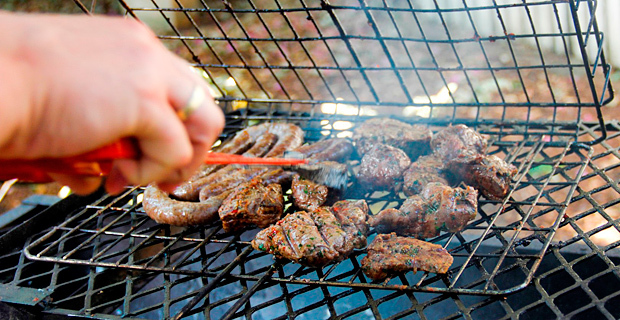 Here are a few pointers on how to braai like a South African. This has traditionally been the realm of the Man. The Neanderthal man would have killed a tree, dragged it to this cave and rubbed two stones together to set the whole thing alight. The modern Neanderthal will purchase wood or briquettes from a cafe or filling station, add some Blitz fire starter or a few liters of petrol and dropped a match into the heap to start an inferno. He would then stand back, pour himself a brandy and Coke and watch the blazing firestorm. It is easier and safer than this. Good dry wood is the best choice. You need a hard wood that makes good coals as coals provide a more consistent heat source. Do not grill your meat on the flames. Make sure the wood is suitable for cooking and not just for heating as some varieties of wood can be poisonous. Use Blitz or newspaper as an initial source of heat if the wood is a bit moist. 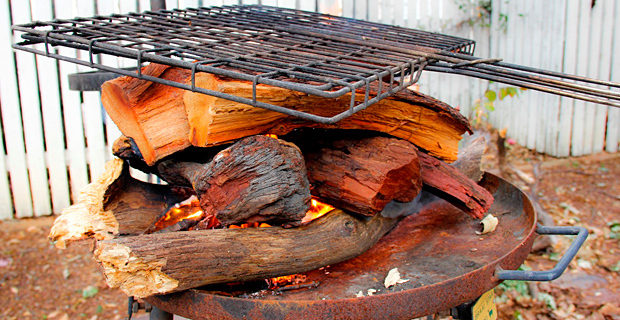 Bear in mind that the fire is the most important aspect of a braai. There has to be enough wood as your fire has to be large enough to produce adequate coals. Timing is crucial. Prepare the fire at least one hour before you want to eat. Of course, for many South Africans the actual eating of the grilled meat is optional. The South African man can spend hours packing the wood, refreshing himself with a variety of alcoholic beverages and then admiring his handiwork while adding more and more fuel to his personal fire. Cooking of the meat and producing a pot full of roasted animal flesh is one of the many outcomes of this primal endeavor. You need a grill and some heat resistant tools to arrange the coals and turn the meat. 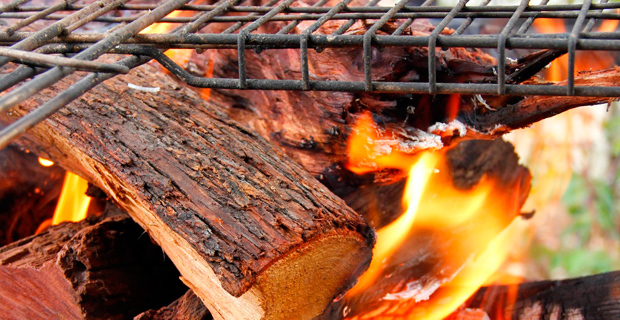 In South Africa’s national parks, there are braai areas at each chalet or camping spot. These usually have an adjustable grill. Often chalets have tools provided; these can range from long stemmed forks to rustic tongs. It is important to mention that under ‘tools’ many braai guys will include ‘appropriate drinks’. This includes enough ice, cold beer, some wine and a range of hard alcohols such as brandy or whisky. These ‘tools’ are essential to keep the fire master properly hydrated and the rest of the company calm when hunger pains become intense. If you are a beginner, keep it simple. When attempting your first braai, do not start with chicken. Never braai a Vienna sausage and do not try any kind of seafood, especially when you are in the Kruger National Park. People will point and laugh. 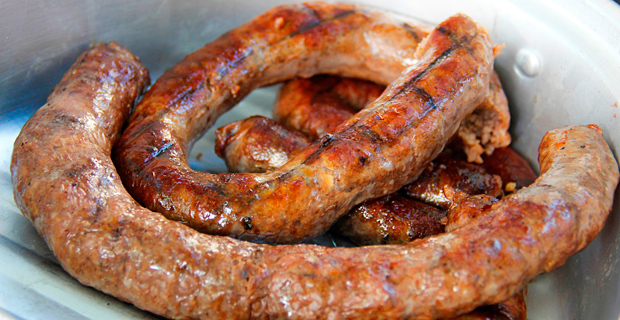 Start with a good quality boerewors. This is a long sausage made with minced beef or pork and flavoured with herbs and spices such as coriander and pepper. Look for a brand with a high percentage of meat and not flavoured with too much fancy stuff such as cheese or chilli. These seasonings often hide inferior meat or soya additives. Put the whole length of sausage on the grill and relish the sizzle of fat droplets in the fire. Eat straight from the grill or wrap it in a bread roll with tomato sauce or chutney. Feeling adventurous, you might want to try real meat. Consider a T-bone or pork. Brush with some oil and seal on both sides before moving the meat to a higher position above the coals. You can then determine the level of internal ‘cookedness’. Season with salt and pepper after it is cooked. Basically anything can be cooked on a fire. Skilled grill masters prepared baked bread, stews and even desserts on an open fire. Vegetables can be wrapped in aluminium foil, dotted with butter and salt and tossed into the coals. Potatoes and butternut are often prepared this way. Most famously, toasted cheese and tomatoes sandwiches are made on the grill. Called braaibroodjies, white bread, slices of tomatoes, cheese and a few slivers of onion are assembled and a few streaks of butter are smeared on the outside of the bread. These sandwiches are then cooked until the cheese is melted and the bread is golden brown. To braai is a return to a primeval state of being. Watching a fire and smelling meat grilling returns life to all the senses – the cracking of wood, tasting, feeling the warmth of the fire and seeing the sparks flying up into a starry sky. This coming alive of the senses is what connects us to nature and to our essence.